There is a lot of confusion when most people think of food allergies and it’s a diagnosis that is most often dismissed by patient’s medical doctors if not often outrightly sneered at. In my opinion this has a lot to do with the terminology physicians use vs. the terms patients use. In my experience patients use “allergy” as a broad reference to any reaction that happens after exposure to any food, chemical or other substance while medical doctors almost always refer to the Immunoglobulin E medicated release of histamine from white blood cells called Mast cells. So in an effort to bridge this divied let’s take a closer look at what the terms mean and see if we can clear up some common misconceptions. Allergies occur when your immune system reacts to a foreign substance such as peanuts, pollen, bee venom or pet dander. IgD 1 Functions mainly as an antigen receptor on B cells that have not been exposed to antigens. It has been shown to activate basophilsand mast cells to produce antimicrobial factors. 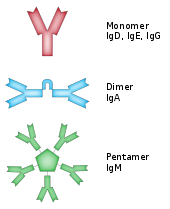 IgE 1 Binds to allergens and triggers histamine release from mast cells and basophils, and is involved in allergy. Also protects againstparasitic worms. So…What’s the Difference between an Allergy and a Sensitivity? Simple….An intolerance is a reaction to food that does not involve IgE. This can include other antibodies such as IgG4 or other mechanisms. Repeated exposure to an target foods can eventually produce allergic-like responses that are usually delayed, with symptoms not being evident for hours—or even days—after the initial exposure. IgG antibodies drive these “delayed” reactions. A common scenario is a patient with a low-grade food allergy to gluten, dairy or another food , who never pinpoints the cause of their misery. The symptoms are vague (bloating, constipation, weight gain) and the exposure is frequent (breakfast, lunch, and dinner), so the connection between the offending food and the symptoms is difficult to make. Over years, the hidden allergy takes a toll on the immune system. The result of an overworked immune system is everything from weight gain to irritable bowel syndrome (IBS) to arthritis. During this process, the lining of the gut becomes inflamed and small fissures open between the tightly woven cells making up the gut walls. These chinks in the gut’s armor allow bacteria and partially digested food molecules to slip into the bloodstream where they are considered foreign invaders. The immune system then mounts an immune response where white blood cells rush to surround the offending particle. The result is inflammation. This smoldering fire occurs every time the offending food is consumed. Most people eat foods they are allergic to several times a day. Every time that food enters the body, the immune system responds with an inflammatory response. Because symptoms can be delayed up to 72 hours after eating, a low-grade food allergy can be hard to spot. Without diagnosis or awareness, the damage is repeated over and over, meal after meal.